Minimalist Japanese retailer Muji has unveiled its largest store in Canada to date, steps away from Toronto’s Yonge-Dundas Square. The 19,110 square foot store is the first in Canada to span two levels and is now the largest Muji store in the world outside of Asia. The store opens to the public at 10:00am on Friday, November 23. 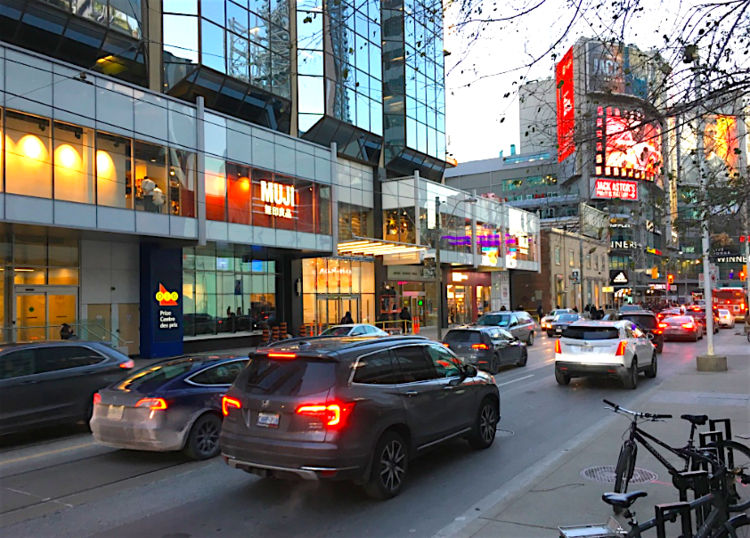 The massive two-level retail space at the Atrium complex was made possible by annexing second-level former office space in the mixed-use building, which spans an entire block along Dundas Street West between Yonge Street and Bay Street. Muji’s address is 20 Dundas Street West, which faces across the street towards CF Toronto Eaton Centre’s H&M flagship. The updated Muji flagship replaces a 4,373 square foot store which opened at 20 Dundas in 2014 — back then, Muji stores were generally smaller and have been progressively getting larger as the company continues to open stores and gain loyal customers and brand awareness. Muji’s Atrium location relocated to a temporary space on Bay Street for several months while its original store was substantially expanded and renovated to create the new mega-flagship. ‘MUJI YOURSELF’, the in-store customization area featuring various services such as embroidery, stamps, sticker printing, and alterations. A laser engraving service which allows customers to have letters engraved onto a vast selection of Muji products such as business card holders, pencil cases, trays, and small storage units. The Muji flagship is also the only Muji location in Canada outside of British Columbia to carry books, made-to-order curtains and rugs, the MUJI Labo collection, maternity wear, as well as brand new activewear collection. The store held a media launch and grand opening during the evening of Thursday, November 22, coordinated by Toronto public relations firm Zenergy Communications. Food was provided throughout the store, including a sampling of food options sold in the store. Dignitaries, including Mr. Akita, officially opened the store with a sake and a drum ceremony. The store’s ground floor features entrances from both Dundas Street as well as from within the Atrium complex, and it includes the store’s aroma bar, alterations, embroidery area and the ‘MUJI Labo’ fashion line, as well as an assortment of fashions and accessories. The second level, which is considerably larger than the ground floor in size, contains areas for the coffee bar and books area, interior advisory, a customization counter (with gift sealing, digital fabric printing and laser engraving), as well as the ‘MUJIYOURSELF’ area with label printing and stamp station. The second level also features a wide range of home goods, food and a large area dedicated to Muji’s famous pens and stationery. As mentioned above, Muji entered the Canadian market with the opening of the downtown Toronto store in November of 2014. That was followed by a 5,225 square foot store at Mississauga’s Square One in November of 2015, followed by the October 2016 opening at Toronto’s Yorkdale Shopping Centre (6,375 square feet) and the Summer 2017 debut of a 6,000 square foot space at CF Markville, north of Toronto. A store at Scarborough Town Centre, measuring about 6,800 square feet, opened in March of this year. On Canada’s West Coast, Muji currently operates three stores — Metropolis at Metrotown was the first when it opened in August of 2017, followed by the Robson Street flagship store in December and most recently, a 6,355 square foot store at CF Richmond Centre which opened in April of this year. The Robson Street flagship spans 14,507 square feet on one level and was the largest Muji location outside of Asia until the opening of the expanded Toronto flagship. As well, The Metropolis at Metrotown store, which measured 7,770 square feet when it opened, was recently expanded to 12,305 square feet on one level to bring it in line with the experience, product selection, and footprint of the Robson Street flagship. Brokerage CBRE has been involved with MUJI’s negotiations across Canada, led by Arlin Markowitz, Senior Vice President of CBRE’s Downtown Toronto Urban Retail Team. CBRE Vancouver‘s office, including Martin Moriarty and Mario Negris, were involved in the three Vancouver deals. Real estate services firm MPA Inc. represents the Atrium and MPA’s president, Mike Parker, negotiated the Muji deal with CBRE on behalf of the landlord. Last year, Muji’s North American President, Toru Akita, said that he expected MUJI to operate between 15 and 20 stores in Canada by the year 2020, and a source working with the company says that the retailer has already mapped out many of the locations where it plans to expand, which may include malls as well as urban street front locations (Mr. Akita confirmed that a search for a Montreal flagship is ongoing). With more than 800 stores worldwide and 7,000 products, MUJI is short for Mujirushi Ryohin, or ‘no-brand superior items’, and was founded in 1980 as the private-label brand of a major supermarket chain.